AppBackup is free software, which means that it respects your freedoms. Its source code is freely available under the terms of the X11 License. If you want to help translate AppBackup into a different language, please see the Translations section. AppBackup does not currently work on iOS 8. This is being tracked as issue #6 on the bug tracker. I have no ETA for when it will be fixed, although I do want to fix it. Currently, app listing works on iOS 8, but the GUI crashes due to bad memory management on my part (probably because I wrote that part of the code when I was in high school). The command-line interface has been updated for iOS 8. Instructions on how to install and use it can be found here. This page, the bug tracker, and the app’s Facebook and Google+ pages will be updated if and when I can get it fixed. I am very sorry for the problems this is causing for people. Compatibility Note: I am unable to test AppBackup on iOS 4 or later because I only have a 2G iPhone. However, users have reported that AppBackup does work on iOS 7. If you have problems, please contact me. You may also try uninstalling and reinstalling AppBackup (you will not lose your saved data in the process). AppBackup is available via BigBoss’s repository (or mine) on Cydia! You can find it under the Utilities section. You can find older versions here. 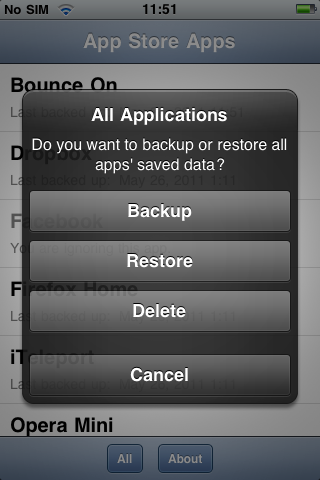 To back up one app, open AppBackup, select the app, and then select Backup. To restore an app, select it and then select Restore. (If there is no restore option, then it hasn’t been backed up yet.) 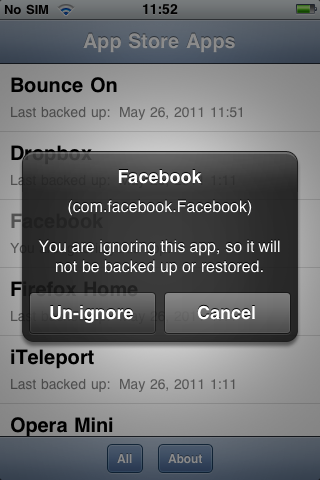 You can also choose to delete an app’s backup, or to ignore or un-ignore the app (i.e. prevent it from being backed up, restored, or deleted). To back up all apps at once, tap All at the top-left of the screen, and select Backup. To restore all apps that have been backed up at once, tap All and select Restore. (You must have at least one app backed up in order to see this option.) You can also choose to delete all backups on your device (except those for apps which have been ignored). The app list only shows apps that have already been installed through the App Store. If you have just reset your device and you want to restore app data, then you must first reinstall the apps whose data you want to restore before AppBackup will let you restore their data. Backups are stored in /var/mobile/Library/Preferences/AppBackup/tarballs as files called <bundle-id>.tar.gz, where <bundle-id> is the respective app’s bundle identifier (e.g. com.ooi.supermonkeyball). These files are regular gzip-compressed tar archives and can be opened with any program capable of viewing them (e.g. 7-zip on Windows). If you want to “back up the backups,” you should back up the entire /var/mobile/Library/Preferences/AppBackup directory tree. Backup times are stored as an XML property list at /var/mobile/Library/Preferences/AppBackup/backuptimes.plist as Unix timestamps. The list of ignored apps is stored as a plain text file at /var/mobile/Library/Preferences/AppBackup/ignore.txt, with each app’s bundle ID on a separate line. Does AppBackup back up data from jailbreak apps (e.g. from Cydia)? No. This is because jailbreak apps store their data in many different places, while App Store apps save their data in sandboxes that I can easily locate. Also, the reason I made AppBackup was because, at the time, there was a known problem with App Store apps’ data being removed during updates. Does AppBackup work with iOS 4/5/6/7/14/1024? Some users have reported that AppBackup works on iOS 4 and 5, but I can’t test AppBackup on iOS versions greater than 3.1.3 because I only have an iPhone 2G. However, if any problems are reported, I will try my best to fix them. Does iTunes back up data that I save through AppBackup? Yes. AppBackup stores its data under /var/mobile/Library/Preferences, which is backed up by iTunes. How do I get my AppBackup backups out of my backup in iTunes? Install the MS Visual C++ 2010 x86 runtime and .NET Framework 4 (Web installer or standalone). If you’re on Windows XP, also install the Microsoft IDN Mitigation APIs. All of these libraries are required to run the program in step 2. Go to the folder where you extracted iPhone Backup Browser to and open iphonebackupbrowser.exe as an administrator (on Vista/7, right-click and click Run as administrator). Click the dropdown at the top-left of the window, and select the backup you want to use. In the top pane, click on the entry whose Display Name is --- and whose Name is System. In the bottom pane, find the entries that begin with “Library/Preferences/AppBackup”. Click on the first one, and then hold down the Shift key while clicking on the last one. Click on the icon that looks like a folder with an arrow on it. Its tooltip will say “Export selected files to C:\temp”. Go to C:\temp, then go to the folder with your device’s name, then System > Library > Preferences. The AppBackup folder contains AppBackup’s data. You need to copy this entire folder to /var/mobile/Library/Preferences on your iDevice in order to use it. Mac OS X instructions coming soon. AppBackup also has a command-line interface (which currently works with at least iOS 2.x–8.1.x). It is available as part of the Cydia package or from the Python Package Index. The command-line interface that comes with the Cydia package is called appbackup, and the one in PyPI is called iosappbackup. Currently, the Cydia one is outdated (I’m waiting to update it in Cydia until I have the GUI working on iOS 8, in order to avoid confusion), while the PyPI one is the one that works on iOS 8. In AppBackup 3, these will both be the same thing, but the name difference will remain in order to avoid conflicts between the two. You can also run iosappbackup --help or just iosappbackup for more help with the command-line interface, or iosappbackup <command> --help for help with a particular command. It will use the Library/Preferences/AppBackup directory inside the directory given with -r as the backup and data location. You can also use the -c (or --config-dir) option to use a different location for the backups and data. NOTE: %@ is a placeholder for various items of text that are included at runtime. You need to have the %@ in the appropriate places in your translations for AppBackup to work. The instructions for each string containing %@ will tell you what the %@ stands for, although for many strings it will be obvious. Sign up for a free account or log in if you already have one. (You will not be able to see the resource otherwise). Click on your language and click Translate Now. If your language is not there, click Add Translation, select your language, and click click Translate Online. Update your translation and click Save All when you’re done. AppBackup is free software, which means that it respects your freedoms. Its source code is freely available under the terms of the X11 License. 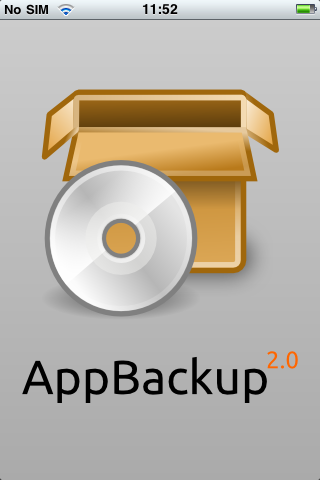 AppBackup also includes software released under similar free, permissive licenses. For the full text of the license and copyright notices for AppBackup and all software included with it, see the LICENSE.txt file in the source repository. AppBackup would not have been possible without the work and help of others. See CREDITS.txt for a list of these people. AppBackup’s source code is available on Bitbucket at https://code.s.zeid.me/appbackup. AppBackup is written in Objective-C, Python 2.5, POSIX shell, and C.
Fixed a bug with translations where if something wasn’t translated then nothing would appear in the UI (expected behavior is that the English text would appear instead). AppBackup no longer crashes if backuptimes.plist is corrupted or malformed. Updated the Czech, Japanese, and Korean translations. Fixed the problem where AppBackup was hanging on the Please Wait screen for many people. Fixed a cosmetic bug with the Please Wait screen. ini-to-strings.py now sorts the list of language files before converting them. AppBackup now works on iOS versions 4.3.x and later (and it still works with iOS 3; untested on iOS 2). Added a confirmation screen for all actions. The GUI, written in Objective-C this time. As a result, the code has been completely rewritten and is much cleaner and object-oriented. The FixPermissions utility can now be used by typing appbackup-fix-permissions at the terminal. It is still run automatically in the GUI mode only. Changed translations format in the source tree. Translations are now managed on Transifex (https://www.transifex.net/) and converted to Apple’s Localizable.strings format at build time. SECURITY UPDATE: FixPermissions now ensures that no directory other than /var is a link. Added the German ß/Eszett to the diacritical mappings used for sorting. This does NOT fix the incompatibility with iOS 4.3.x. I am still working on fixing that. 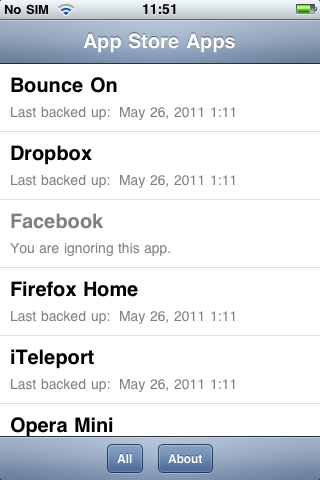 Added the ability to ignore and un-ignore apps in the backup list and when using the All button. The unique bundle ID of each app is now displayed under its name in the backup/restore prompt. Fixed a bug where AppBackup would crash if the modification time of a backup file was used instead of a non-existent backuptimes.plist entry. Fixed a couple of bugs in the old method of finding apps. Reverted to the old method of finding apps because it is faster. Fixed some problems with the English strings for deleting backups. Fixed logging when deleting backups. Simplified localization code in BackupAll/BackupOne. The action argument of on(OneApp/AllApps)DoAction_withModalView_ takes an unlocalized string now. Added a Dutch translation by Dennis Morren. Added a Russian translation by Nikita “ZAY” Peshkov. Added proper error-checking when backing up or restoring/deleting a backup. Added the ability to delete backups (only translated to English and Russian for now). The modification time for the backup file is now used as a fallback if the file exists but the app is not in backuptimes.plist. Added Retina images for the icon and splash screen. The Retina icon is slightly different than the low-resolution icon. Now released under the X11 License. The Web site’s domain name is now pages.srwz.us. Full changelog now shipped with AppBackup and shown in the About dialog. Tweaked the debug.log format a tiny bit. Setuid root binary called FixPermissions added to fix permissions on startup. PermissionsFix is now FixPermissions.old and is deprecated. Changes related to Python naming conventions and docstrings in include/globals.py. Source tree reorganized, changes and credits reorganized, and build process changed. README and LICENSE files added. Added an Italian translation by Pietropaolo Mastromarco. Fixed a bug where the restore option didn’t appear if we couldn’t get a localized date string from the operating system, even though the app was backed up already. (Only of interest to developers) Sorted the functions in include/globals.py alphabetically, except for a couple of long ones which were left at the bottom. Added a Spanish translation by Ramón Cutanda. Changed the debug logging method again. Threads now have autorelease pools. This version is mainly intended to help me figure out crashing problems that people are having, although the above change might help some. Fixed another problem when upgrading to 1.0.7 or later from 1.0.6 or earlier. AppBackup no longer crashes on a new install. Fixed complications when upgrading to 1.0.7 or later from 1.0.6 or earlier. Attempted to fix AppBackup crashing on new installs. There is NO version 1.0.8! Moved backup location to /var/mobile/Library/Preferences/AppBackup so that iTunes will back them up. Added a French translation by Marc Klein and I forgot to mention it. Worked around a problem caused by MobileSubstrate support, which was removed. Fixed a problem where apps whose .app folders’ names had non-ASCII characters in them (e.g. “é” or “™”) would crash AppBackup. CPU-intensive functions are now executed in separate threads. This should result in better performance. Specifically, finding apps and the actual backup and restore processes are now executed in separate threads. The method used for finding apps has changed except for firmware versions below 2.1. Reorganized the code A LOT. Changed the debug logging process. Source is now compiled into optimized Python bytecode to run a little quicker; this may fix some crashing problems people have been having, especially after updating to 2.1. Changes to UI: All and About buttons moved to bottom; buttons in dialogs are now on separate rows. This is to better support translated strings. Sorting of apps in the list is now done case-insensitively. Added support for localization. If you want to help translate AppBackup into a different language, please contact me.